Chris Froome seized early control of the Tour de France, the 2013 champion snatching the yellow jersey after a crash-marred third stage won by Spain's Joaquim Rodriguez on Monday. Katusha rider Rodriguez had the best kick up the punishing Mur de Huy, where the Fleche Wallonne classic ends, beating Team Sky's Froome by a narrow margin while France's Alexis Vuillermoz ended up third, four seconds back. Rodriguez, who won the Fleche Wallonne in 2012, attacked about 400 metres from the line and held off Froome. "It is very unexpected, I was hoping to be up there today and to put more time on my rivals," Froome told reporters at the end of the 159.5km ride from Antwerp, Belgium. Overall, Froome leads German Tony Martin (Etixx-Quick Step) by one second with American Tejay van Garderen in third place 13 seconds off the pace after losing 11 seconds on the day. Swiss Fabian Cancellara, in yellow at the start, was caught in a massive crash that forced organisers to neutralise the race for about 10 minutes. "Just left the hospital with a huge disappointment #TDF2015 is over," Cancellara wrote on his Twitter feed. His Trek Factory team said he broke two vertebrae in his lower back. Colombian Nairo Quintana (Movistar) and defending champion Vincenzo Nibali (Astana) also lost 11 seconds but they are still in the game 1:56 and 1:38 behind Froome respectively. Spain's Alberto Contador lost 18 seconds but lies only 36 seconds off the pace before Tuesday's tough fourth stage that features much feared cobbled sectors. 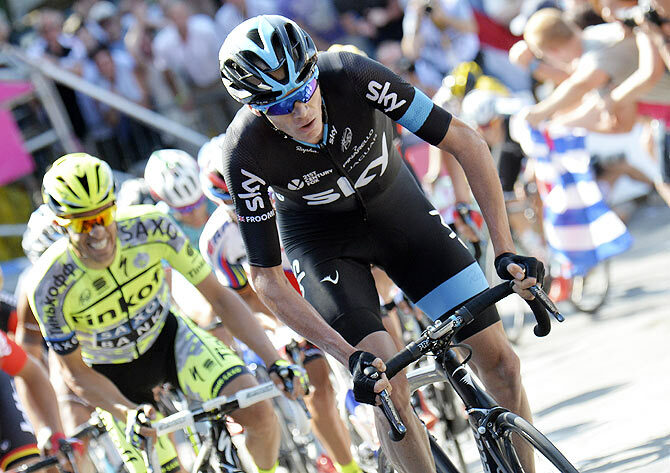 "Froome is very strong, he almost won the stage. There are a lot of days left, we have to stay positive. Tomorrow we'll have to survive," said Contador. "It's an incredible Tour with every day a lot of stress, a lot of tension, it's very nervous." Frenchman Thibaut Pinot's hopes of a podium finish in Paris took a major blow when he finished one minute 33 seconds behind. The FDJ rider is now 2:58 off the pace. Pinot explained he was shaken after a huge crash took down a couple of dozen riders with less than 60 kilometres left. His teammate William Bonnet fell off his bike after seemingly touching a wheel in front of him and others all around him were brought down on a gently descending stretch of road. Cancellara was one of several top names to hit the tarmac, along with Australian Simon Gerrans and Dutchman Tom Dumoulin who abandoned the race. Bonnet was taken away by the race medical staff on a stretcher but he was conscious. His team said he was to undergo surgery on a broken cervical vertebra, although his condition was not serious. 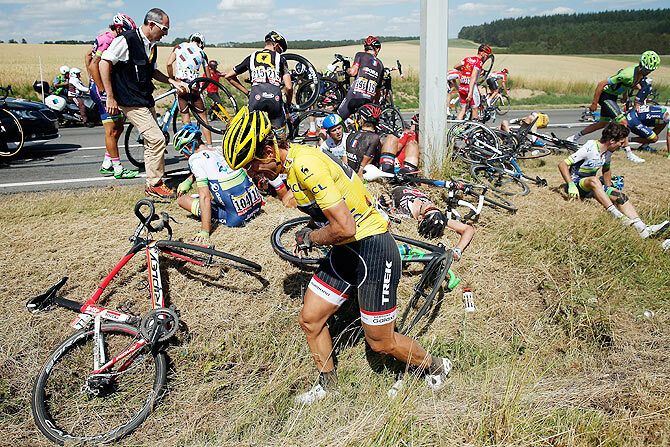 "We were riding at high speed, about 85-90 kph, and we heard a huge noise," said Rodriguez. "For the race to be neutralised it has to be pretty serious."